So far in this section we have seen how we can stop threads from running using the sleep() method of the Thread class to allow other threads some processing time. We have also used the synchronized keyword to lock an object within a method or a block of code. We looked at how we can enter a deadlock scenario when two or more objects go into a deadly embrace waiting for the lock of the other object. In the last lesson we looked at thread priorities and how we can assign priorities to different threads to bring some order to thread selection in unison with the use of the yield() method. In our final lesson of the section we explore how threads can communicate with each other when they are within a synchronized method or code block. The Object class comes with three methods that are for use within synchronized sections of code and as they belong to the Object class are available through inheritance to all objects we create. The methods in question are wait(), notify() and notifyAll() and allow threads to communicate to other threads that they are entering a blocked state or leaving a blocked state so they can cease or resume execution respectively. public final void notify() Wakes up a single thread that is waiting on the invoking object's lock. public final void notifyAll() Wakes up all threads that are waiting on the invoking object's lock. public final void wait() Current thread is put into a wait state until another thread invokes the notify()or notifyAll() method for this object. public final void wait(long timeout) Current thread is put into a wait state until either another thread invokes the notify() or notifyAll() method for this object, or a specified amount of time has elapsed. public final void wait(long timeout, int nanos) Current thread is put into a wait state until another thread invokes the notify() or notifyAll() method for this object, or a specified amount of time has elapsed, or a certain amount of real time has elapsed. In the example code below we are creating two threads for the same object and passing them through some synchronized methods. We looked into synchronized methods and blocks of code in the Synchronization lesson, so nothing new here, just usage before we do some thread communication so we can see the difference. 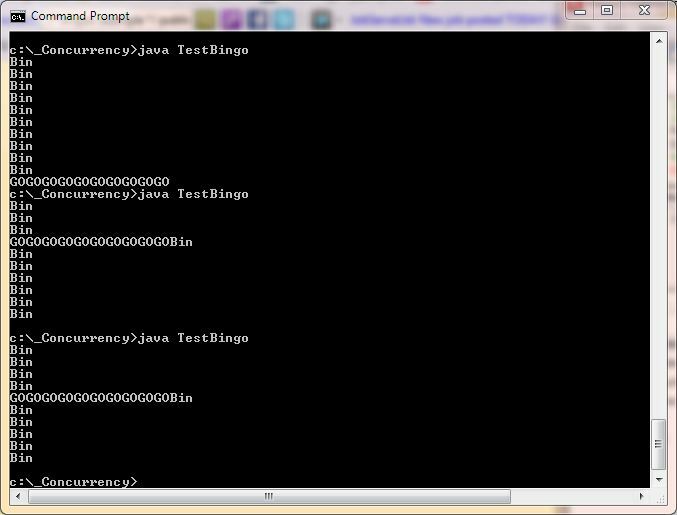 Save, compile and run the TestBingo class in directory c:\_Concurrency in the usual way. The screenshot shows the results of three runs of the TestBingo class and as you can see the results, as we would expect, are fairly random depending on which thread has control of the object lock. The running of the methods is purely down to the scheduler moving the threads in and out of a runnable state. As mentioned at the start of the lesson the Object class provides us with methods we can use within synchronized sections of code. The notify() method wakes up a single thread that is waiting on the invoking object's lock and the notifyAll() method wakes up all threads that are waiting on the invoking object's lock. Both the notify() and notifyAll() methods don't give up an object's lock, although generally the thread in question exits the synchronized code block shortly after using these methods, which then releases the lock. 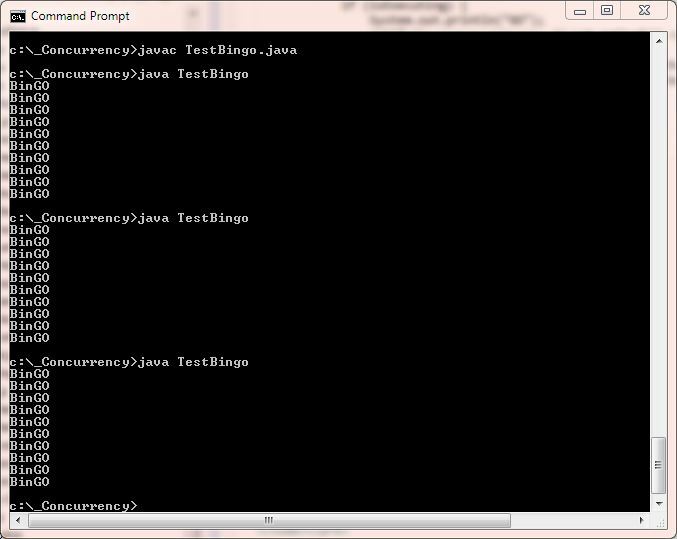 Save, compile and run the revamped TestBingo class in directory c:\_Concurrency in the usual way. This thread can regain the lock and call method1() again with the isExecuting flag set to false. This thread can regain the lock and call method2() again with the isExecuting flag set to false. The above two scenarios can get repeated over and over again and the most likely output is that we get "BinGO" printed out as in the screenshot. This is because it's a more likely event than one thread getting the lock three times in a row. If thread 2 gets first shot then in all likelihood the output would be mainly "GOBin" because it's a more likely event than one thread getting the lock three times in a row. Of course these methods and output are simplified for learning and you can ensure thread order with more rigorous coding than that shown. We will go into this later in this lesson when we look at putting wait() in a loop. Save, compile and run the TestWaitNotify class in directory c:\_Concurrency in the usual way. A thread will do a notifyAll() when it ends, which is what happened with our example. Java uses wait() and notifyAll() on threads, to internally implement join(), so interfering with this behaviour can lead to strange results. A thread can do a spurious wakeup, which means it can wake without being interrupted, notified, or timing out and this will be discussed in putting wait() in a loop. Save, compile and run the reworked TestWaitNotify class in directory c:\_Concurrency in the usual way. The screenshot shows the results of running the reworked TestWaitNotify class and this time only one of our threads gets notified as expected. If you run this code you will need to CTRL-C to end it as the other three threads are sitting there waiting to be notified. Ok all we need to do to see the notifyAll in action is to change the call to notify to a call to notifyAll. Once you have made the change save, compile and run the revamped TestWaitNotify class in directory c:\_Concurrency in the usual way. The screenshot shows the results of running the revamped TestWaitNotify class and this time when I run this on my machine, once again only one of our threads get notified. If you run this code you may need to CTRL-C to end it as some of the other threads may still be sitting there waiting to be notified. Ok, so what went wrong this time? Well looking at the screeshot closely we can see that Thread-4 which relates to the Totalizer object we create actually runs after Thread-0 and then does the notifyAll(). Then Thread-3, Thread-2 and Thread-1 run and go into a waiting state and will just sit there waiting as nothing is going to notify them now. Once you have made the changes save, compile and run our final version of the TestWaitNotify class in directory c:\_Concurrency in the usual way. The screenshot shows the results of running our final version TestWaitNotify class and this time all the threads get notified and the code finishes correctly. By coding to a conditional loop we can ensure that we only ever enter a wait state when it is necessary. By doing this we avoid spurious wakeups and threads being sent to a wait state after any nofications have already been sent. Save, compile and run the TestWaitNotifyLoop class in directory c:\_Concurrency in the usual way. Now we have put our wait() method inside a while loop only ShowTotalizer threads that run before the Totalizer thread finishes are put into a wait state. As soon as the Totalizer thread finishes totalling we set the boolean stillTotalling to false and do a notifyAll() on all threads currently in a wait state. Any remaining ShowTotalizer threads will never be put into a wait state and so now there is no need to worry about spuriously woken or hanging threads. We start a new section looking at collections and generics.